There are several areas that we'd like to tackle in regards to styles; first we will introduce you to importing and exporting your styles, THEN we'll cover some basic tips on developing your first style. •Export with Wrapper - If you've made changes to the default wrapper, or created a wrapper specifically for the style that you're exporting, then you'd want to select this option. •Export without Wrapper - If you have not made any changes to the default wrapper, and your style is using the default wrapper, you'd want to select this option. Importing a new style is also quite the simple task; at the bottom of the Style Management screen you'll see a tab named "Import", simply click this tab and you'll be brought to the "Import Style" page. On this next page you'll have an option to select the file to import, and then by clicking the "Continue" button your style will be uploaded. 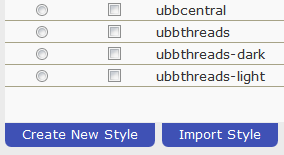 Once your style is uploaded you will be directed to the Style Update screen where you can make adjustments to the style; if you'd like to make changes you may do so now, or you can just select the "Update or Add Style" button (an image of this page can be seen in the "Developing a Style" section below. You can return to the Style Editor at any time by selecting the "Edit" link next to the style on the Style Management screen. Developing a style can have some caveats of it's own as the formatting of the styles require that you know, or at least understand greatly, how CSS formatting works. If you're unfamiliar with CSS we'd recommend that you either Contract Out for your style services or, at the very least, we recommend that you read up on CSS at a site like w3c Schools. If you're insistent on creating your own style, we recommend that you take and load the default/stock styles in the editor so that you can understand what each element does and how some of the default CSS is designed to make the display appear as it does in that style. Return to the Category "Control Panel"